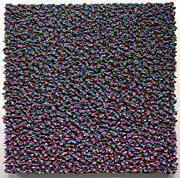 Brian Gross Fine Art is pleased to announce Workings, an exhibition of new paintings by New York artist Robert Sagerman. The exhibition opens Thursday, November 5, with a reception from 5:30-7:30 pm. 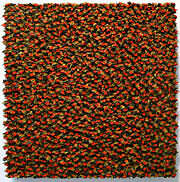 The artist will be giving a gallery talk Saturday, November 7, at 2pm. 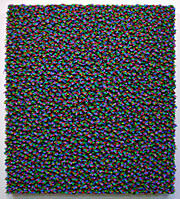 Robert Sagerman's work consists of rich, transcendent color fields that activate the eye. 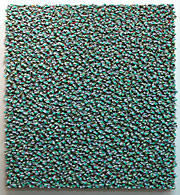 He builds up the lush surfaces by methodically applying thousands of daubs of oil paint to the canvas, layer upon layer. 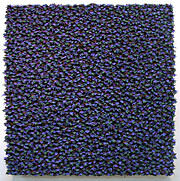 As a result, the paintings possess sculptural qualities that make for a unique optical experience, with the vibrant color palette contrasting the deep shadows created by the surface texture. Though the works are highly conceptual and process oriented, the complexity of the colors and sensuality of the thick layers of paint make for beautifully imposing pieces that assert their physicality. In his gallery talk, Workings: The Realization of Objecthood in Painting and Jewish Mystical Practice, Sagerman will elucidate the relationship of Jewish mysticism to his work. 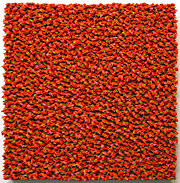 For him, the meditative repetition of his working process becomes a transcendent experience. Influenced by the spiritual practices of the mystics, the artist sees his paintings as “attempts to apprehend the immaterial, engaged through material means. ” In this way, the resulting objects are merely corporeal reflections of the intangible processes, or “workings,” involved in their creation. Part of Sagerman's process involves meticulously counting and journaling the thousands of strokes of paint used to create each piece. 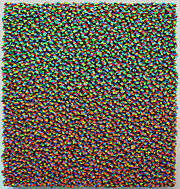 The total number of strokes becomes the title of the work (such as 14,113), referencing the temporal process of working, which Sagerman sees as the immaterial essence of the painting. The artist aims to capture and illuminate the temporal element of his process through a digital component in the exhibition. Born in Bayside, New York in 1966, Robert Sagerman received his MFA in Painting and MA in Art History from the Pratt Institute in 1998, his MA in Religious Studies in 2000 from New York University and his PhD in Hebrew and Judaic Studies from New York University in 2008. Sagerman has participated in numerous exhibitions in New York, Atlanta, Chicago, and Germany. 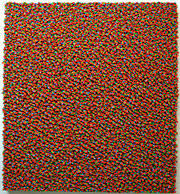 The San Francisco exhibition continues through December 26 and is his third at Brian Gross Fine Art.